Many dancers suffer this condition and it is not easily treated. In all cases please visit a medical professional . These articles are written to help you have a better understanding of conditions that may or may not affect you. So what is Morton’s Neuroma? In medical terms it is a benign tumour of a nerve caused by an abnormal growth of nerve cells in response to an irritation. However, it is not really anything more than this irritated nerve which has developed through compression or irritation or a combination of both. The site is normally either at the base of the largest bones in the toes or between the metatarsal heads .Incorrect bio-mechanics of the foot or issues from shoes that can create compression are the usual causes. It occurs as a lump in the feet which could be mistaken for a tumour but is actually the tissue which has thickened up due to the development of fibrous tissue protecting the nerve between the toes.. The toes are a delicate part of the body and there are nerves between the toes. When these get trapped and damaged, fibrous tissue develops around the nerve and compresses which in turn will cause the pain. Some people say that it is like walking with a bit of glass in your toes, walking on a pebble or sharp rock. A pain that can start in the ball of the foot and shoot into the affected toes. There may also be burning and tingling of the toes. The symptoms are usually felt up the sides of the space between two toes. Or simply, a pain in the toes. In other words, it is not a very pleasant thing from which to suffer. Various causes can be from putting strain onto the toes when standing on toes where shoes, unlike Pointe Shoes for Ballet Dancers, have not actually been designed for such use. Wearing high heel shoes where you are thrown forward and the ball of the foot starts to take the pressure. This is an issue with many fashion heeled shoes. Yes, they may look great but orthopedically, they may not be well designed and balanced for the wearer. Good shoe designers know perfectly well how to create a design that is well balanced, support the wearer and reduces issues such as foot fatigue. So, who gets Morton’s Neuroma? The doctors have not quite been able to figure out the exact cause for this condition, but the history and observation of the treated have shown that continuous excess pressure being applied to a certain part of the foot might be the reason behind it. The great majority of sufferers are indeed women and while the condition can be created and exacerbated by wearing high heel shoes, , it can, on occasion, also affect men. The condition is much more common in women than men, probably as a result of wearing high-heeled, narrow-toed shoes. This style of shoe tends to shift the bones of the feet into an abnormal position, which increases the risk that a neuroma will form. Being overweight also increases the risk of a Morton’s neuroma. Tight shoes with inadequate space at the toe and high heels are the biggest problem causing agents as they both compress the toe bones and pinch the nerves in the feet. High impact sports like athletics or sports requiring constrictive footwear (like rock climbing, Irish Dance, Highland Dance and ballet) could exert excessive pressure on the nerves of feet. People with foot deformities like bunions, flatfeet, hammertoe, or unusually joint flexibility are at a greater risk of developing Morton’s neuroma. So lets look at this in some more detail..
A neuroma is an abnormality of a nerve that has been damaged either by trauma or as a result of an abnormality of foot function. The most common location of a neuroma is in the ball of the foot. In this area the nerve can become pinched and inflamed by the abnormal movement of the bones in the ball of the foot. As the condition progresses the nerve may become permanently damaged and surgical removal of the nerve may be necessary. If Morton’s neuroma is diagnosed early, treatment will aim to reduce the pressure on the affected nerve. While this condition is not really a dangerous condition of foot pain, doctors recommend that it should not be ignored at all. Especially when the pain remains for a long period of time and also does not improve even after conservative treatments. 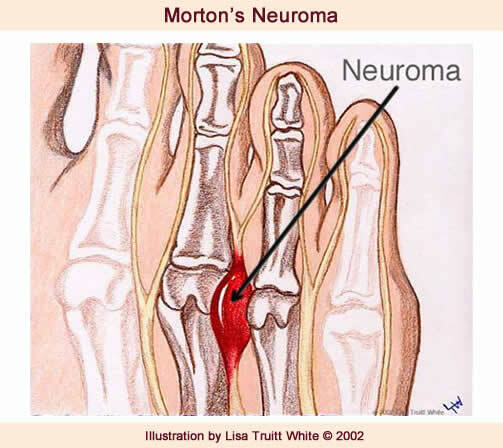 Where is Morton’s Nueroma in the foot? This is usually the nerve between the third and fourth toe bones (metatarsals) or at the base of the biggest bones in the toes. • Shoes. As a dancer you may also need to stop going onto your toes or wearing stiletto style footwear. Going onto your toes in inadequate footwear that does not support your feet and allows your foot to slide down onto the toes is a definite no-no and should always be. Your toes are not meant to take the weight of your body. • Resting your foot and massaging your toes may also help to relieve the pain. You can make an ice pack by freezing a small bottle of water and rolling it over the affected area. When all other measures have failed to relieve pain, open surgery may be necessary to remove the neuroma. It is critical that Morton’s neuroma surgery be performed by surgeons who have considerable expertise and experience in this surgery because in some cases, Morton’s neuroma surgery can result in increased foot pain or even the return of the neuroma. This school of thought is to remove the nerve that has been effected by the Morton’s neuroma entirely. With the damaged nerve tissue removed, the neuroma is less likely to occur, and the mechanical stresses on the foot are not increased. In most situations, the nerve itself with the resulting neuroma is removed. The incision is closed, and the patient is taken to recovery. With this approach, you can bear weight on your foot post-operative, however it still takes 3-4 weeks to fully recover. Surgery is usually a treatment of last resort. It may be recommended if you have severe pain in your foot or if non-surgical treatments haven’t worked. Most people (about 75%) who have surgery to treat Morton’s neuroma have positive results and their painful symptoms are relieved. As with all surgery, complications can occur after having an operation for Morton’s neuroma. You should discuss these with your surgeon before having the procedure. Infection around the toes and thickening of the skin on the sole of the foot (plantar keratosis), which may require further treatment, are two possible complications that can occur following surgery. One thing of which to be well aware – careful of the shoes you wear, especially if you still have scar tissue. While there may be issues with some numbness, full recovery may, in some cases take more than 2 years. You should still be able to dance but if you feel a bit sore, consider the width of the shoes. They should not be too tight across the toes. Yes, you can stretch the part where there is any pressure but of course do not over stretch it as your foot should work out the width considering that we use soft leather and not outdoor shoe leather. Some issues may remain if wearing Jigs that do not support you if you are on toes. Avoid high heels and always think what you are wearing when not dancing. Center for Morton’s Neuroma. “What is Morton’s Neuroma?”. Bencardino J, Rosenberg ZS, Beltran J, Liu X, Marty-Delfaut E (September 2000). “Morton’s neuroma: is it always symptomatic?”. AJR Am J Roentgenol 175 (3): 649–53. doi:10.2214/ajr.175.3.1750649. PMID 10954445. Reed, RJ; Bliss, BO (February 1973). “Morton’s neuroma. Regressive and productive intermetatarsal elastofibrositis.”. Archives of Pathology 95 (2): 123–9. PMID 4118941. Scotti, TM (January 1957). “The lesion of Morton’s metatarsalgia (Morton’s toe).”. A.M.A. archives of pathology 63 (1): 91–102. PMID 13381291. This article is also non commercially available as a PDF file to share understanding among dancers and teachers.